Long before I knew thousand island was a type of salad dressing I knew it as a place, a destination, although I'd never been there. If you'd listened to my mother though, you'd have thought we came close--often. My mother learned to drive late in life. I was probably about eight or nine which would have made by brother about three or four when she got her license. Riding along with Mom was always an adventure. Why? Because she got lost so often--or at least she would tell us we were lost. We always did manage to make it back home but not before we heard the familiar line, "If we go any farther we're going to hit Thousand Islands!" Now it wasn't until much later in my life that I learned that Thousand Islands actually is a place and there are actually more than a thousand islands there. It is located on the St. Lawrence River along the New York and Canadian border. It sounds intriguing to the writer in me as it is said there's a story that goes along with every island. 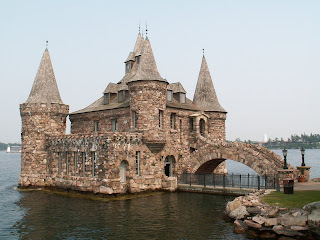 One such story is of the wealthy owner of the Waldorf Astoria who began building a castle for his wife on Heart Island. Unfortunately she died or as some suspect, ran off with the chauffeur and he abandoned the project but it remains a popular tourist attraction. In order to qualify as an island the piece of land in the river has to remain above water all year and have at least two trees. One such island called Just Room Enough, takes its name from the fact that there is just room enough for the little house that sits on it. According to what I read, the people who own it were looking for somewhere to get away from the hustle and bustle of life and wanted a place where there would be no traffic and they would be away from people. Unfortunately, it became a popular tourist attraction with lots of gawkers. But what about the salad dressing, you ask? There are several stories but the one that makes most sense is that the wife of a local fishing guide would make the dressing for lunch for her husband's clients. A famous New York actress liked it and named it after the area. She shared the recipe with George Boldt (the castle building guy) and he served it in his hotel restaurant. The locals who make the dressing now say that the mass market production is nothing like the original. They bottle their own each summer season and when they sell out, it's gone until the next year. 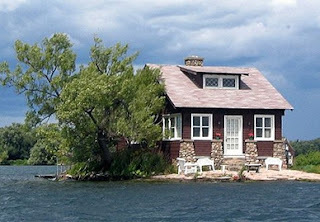 Bottom line, if we ever get lost driving through New York, I want to end up at Thousand Islands. It sounds like a great place for a travel adventure. Travel Anxiety- Am I Ready For This Trip? Would You Eat At A Cat Cafe? Germaphobes Beware the Beach Sand! How About A Sandwich With That Complaint?